Indications: Treatment of infertility in women and men. In men, the drug promoted androgen production. In women, the drug acts like luteinizing hormone – promoting ovulation. Summary Recommendations: HCG is a hormone found in males and females. When levels of the hormone are lacking, fertility can be affected. HCG is only prescribed to female patients who have not gone through menopause and male patients with lower than normal hormone levels. Common side effects in men using hCG include increased facial hair, lowering of the voice and descending testicles in a male patient with one or two testicles that have not dropped into the scrotum. General side effects may include headache, nausea, swelling, fatigue, and pain or redness at the injection site. Serious allergic side effects have been reported in some patients. If you develop hives, rash or extreme itching of the skin seek medical attention immediately. Other symptoms of an allergic reaction include feeling short of breath, feeling tightness in the chest or suffering swelling of the face, tongue or eyes. HCG injections are typically done at the doctor’s office, but your doctor may allow you to complete the injections at home. If you have any questions about injecting HCG ask the doctor before starting treatment. Effects While Trying to Conceive: HCG promotes sperm and egg production and, as such, promotes fertility. If used as directed, the hormone should increase your chances of conception. There are no reports of impaired fertility associated with HCG use. Effects on Pregnancy: HCG use during pregnancy is associated with malformation of fetal limbs and impaired central nervous system function or development in animal studies. No human studies have been completed, but the Food and Drug Administration believes the drug poses risk to the human fetus. 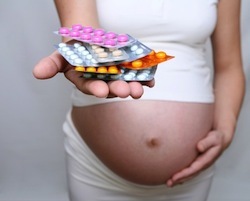 HCG should not be used when pregnant. Your doctor may require a pregnancy test before starting HCG therapy. Safe During Breastfeeding: It is not known whether or not HCG is excreted in human breast milk. Neither human nor animal studies have been completed. Due to a potential risk to the infant, your doctor may suggest waiting to start HCG therapy until you stop breastfeeding.